A new opening PhD position in medicinal chemistry is available at University of Gothenburg, Sweden. The initial contract for this position is 5 years. The deadline to apply is February 28, 2019. Research and graduate education at the department of chemistry and molecular biology comprises a wide scientific field from the atomic and molecular levels all the way through cells to intact organisms. Much of the phenomena studied here impact on our natural environment and living systems. We participate in undergraduate programs in chemistry, molecular biology, medicinal chemistry, biology, marine sciences, and pharmacy. A third cycle education at our department will lead to a Ph.D. in Natural sciences, or Natural sciences with a specialisation in Chemistry, Biology or Biophysics. Ph.D. studies comprises four years at the post graduate level. The time period can be extended to 5 years in total through teaching and/or other departmental duties. Information about the research group: The group of Bjrn Burmann uses state of the art NMR-spectroscopy to study large molecular complexes underlying basic cellular functions at the atomic level in combination with other structural biology methods and biophysical characterization. Our group will use E.coli based expression for specific isotope-labeling suited to study large proteins and their respective molecular complexes playing an integral role in mitochondrial DNA maintenance and protein quality. Results of previous studies into transcription regulation as well as protein quality control at the atomic level have been published in top journals (Burmann et al. Science 2010/Burmann et al. Cell 2012/Burmann et al. NSMB 2013/Thoma, Burmann et al. NSMB 2015/Morgado, Burmann et al. Nat. Comms. 2017). More details on our research can be found at: (www.wcmtm.gu.se/research-groups/burmann). The PhD project, financed by the Knut and Alice Wallenberg Foundation, aims at advancing our molecular understanding of the function and regulation of DNA maintenance within mitochondrial. Mitochondrial malfunction is at the heart of a multitude of different diseases. The PhD student will be exposed to a broad range of scientific tasks and research questions that require a genuine interest in and knowledge of a multitude of scientific aspects ranging from basic biochemistry to advanced structural biology methods (not restricted to NMR-spectroscopy only, as it is planned to also apply X-Ray crystallography or cryo-electron microscopy whenever indicated by our data) and biophysical characterization (Biolayer-Interferometry, Isothermal Titration Calorimetry and optical tweezers (the latter through an existing collaboration)). Methods in microbiology, molecular biology, bioinformatics, and biochemistry will also be used. 1. has been awarded a second-cycle qualification, 2. has satisfied the requirements for courses comprising at least 240 credits of which at least 60 credits were awarded in the second-cycle, or 3. has acquired substantially equivalent knowledge in some other way in Sweden or abroad. To meet the specific entry requirements for third-cycle studies, applicants must: (i) have a second-cycle (advanced-level) degree in a relevant* subject area in the natural sciences, or (ii) have completed studies for at least 60 higher education credits at a second-cycle level in relevant subject areas in the natural sciences, or (iii) have completed a corresponding program of relevance to the planned third-cycle program, in Sweden or in another country, or have equivalent qualifications. The specific entry requirements also include an acceptable command of spoken and written English. Guidelines for assessing English proficiency may include a minimum score of 550 on the TOEFL test (or 213 on the TOEFL-CBT, or 79 on the TOEFL-iBT). Regulations for the evaluation of qualifications for education on a doctoral level are given in SFS 1998:80. Additional information about the assessment: We seek a talented and dedicated student eager to pursue a career in dynamical structural biology. You should be open-minded, eager to learn, and have a genuine interest in science. The graduate student will be exposed to a broad spectrum of scientific tasks as well as questions related to the project and in turn a genuine interest in as well as knowledge of biochemistry and structural biology is mandatory. Educational courses and other previous experience with protein expression and purification of nucleic acid interacting proteins, expression and handling of nucleic acids (DNA and RNA), isotope-labeling for NMR studies, solution NMR spectroscopy with focus on structure and dynamics, molecular biology, biophysical characterization, chemical biology, and biochemistry work is considered as an advantage. Furthermore, experience in biophysical analysis and mathematics is considered as an additional merit. You should be able to work independently as well as in a team and communicate well in English. 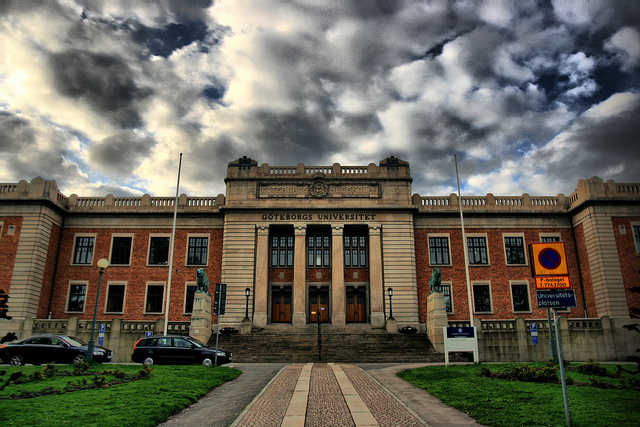 Extent: 100 % Location: Department of Chemistry and Molecular Biology, Gothenburg First day of employment: as agreed Regulations for the evaluation of qualifications for education on a doctoral level are given in SFS 1998:80. A new employment as a PhD student applies for a maximum of one year. The Appointment may be prolonged for up to two years at a time. The total employment period may not be longer than the equivalent of four years of full time time doctoral studies. In order to apply for a position at the University of Gothenburg, you have to register an account in our online recruitment system. It is the responsibility of the applicant to ensure that the application is complete in accordance with the instructions in the job advertisement, and that it is submitted before the deadline. The selection of candidates is made on the basis of the qualifications registered in the application.